Sew Proud to be Five! When my daughter opened her big gift for her fifth birthday, my heart nearly burst as she unwrapped her first sewing machine. She has been asking for one for awhile so I did a lot of research to find a quality machine that will grow with her. Janome makes an adorable 3/4-sized Hello Kitty machine that came with rave reviews. I was sold and my daughter was over the moon. And it wouldn't be complete without a sewing kit filled with thread & needles. Adeline in action. So careful. Looking for a craft for the kids on a sniffly, cold, wet, rainy day? 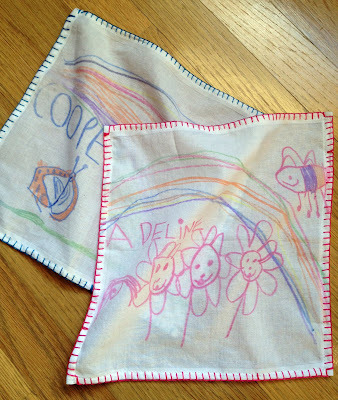 Customized hankies, of course! Crayola makes fabric crayons which are so easy to use. Simply have the kids draw a picture on a blank white sheet of paper (don't forget that the image will reverse, so help them write any words backwards!). Put the paper face-down on the hankie and iron on a hot setting. Be sure to find hankies that are made of synthetic fibers rather than cotton, as the ink will not hold up in the wash! To frame their little masterpieces I added an embroidered trim. Making valentine cards with my kids is beginning to rival the joy I feel making their Halloween costumes. 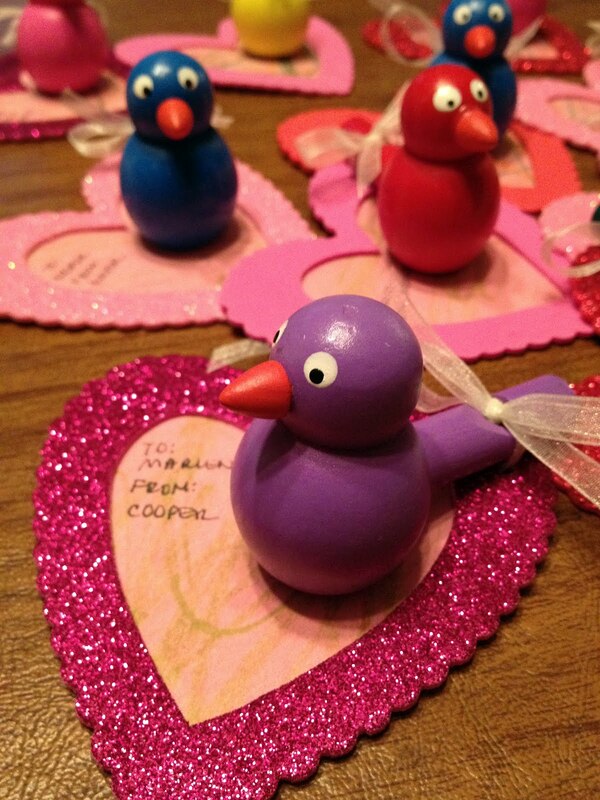 I like the collaborative effort along with the handmade creations. My 2-yr-old's class is studying music this year, so we decided to make these framed art cards with a wooden bird whistle attached. I found the wooden bird whistles at Oriental Trading Company and the foam frames at Joann Fabrics. The art is straight from Cooper's heart. 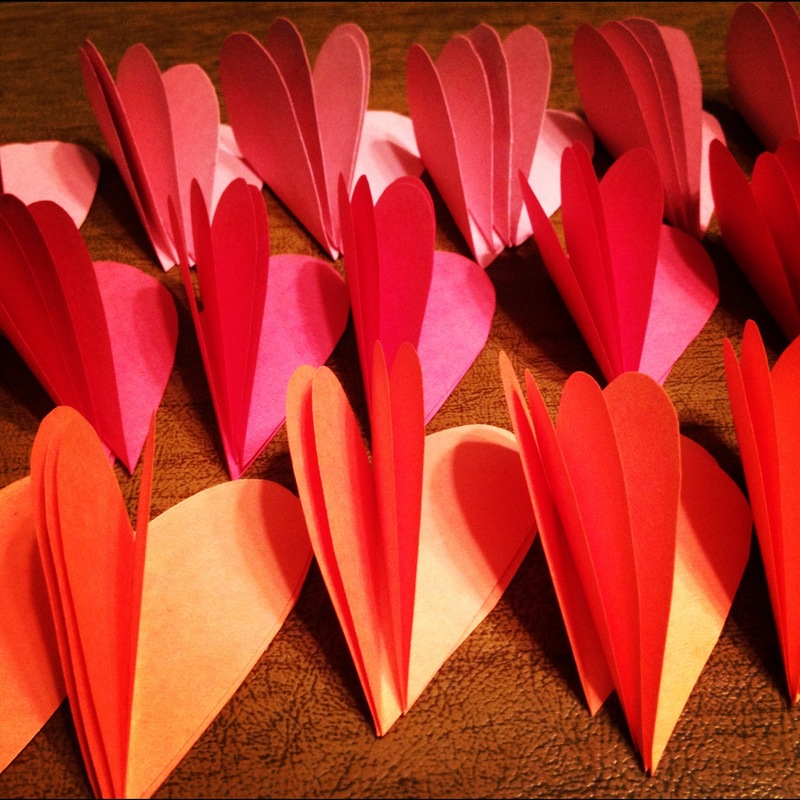 For my 5-yr-old's cards, we changes our original plan of making lollipop flowers with heart petals (via Martha Stewart's website). 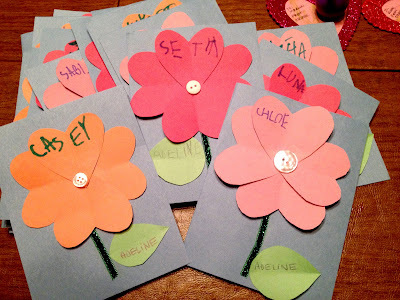 I realized that candy is frowned upon in her classroom, so we used the cut heart petals to make flower cards. The stems are metallic ribbon strips and we finished the centers with various white buttons. They came out adorable, even sugar-free. Couldn't resist making this adorable crocheted heart brooch for myself today. I used a gold metallic leather to make the arrow with a grey felt backing. Every year I troll the internet for fun, crafty, kid-friendly valentines to mass-produce for my kid's classmates. 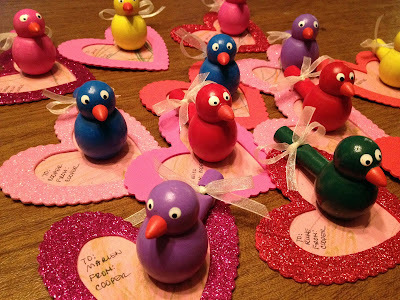 This year I was inspired by Martha Stewart's lollipop valentine project. 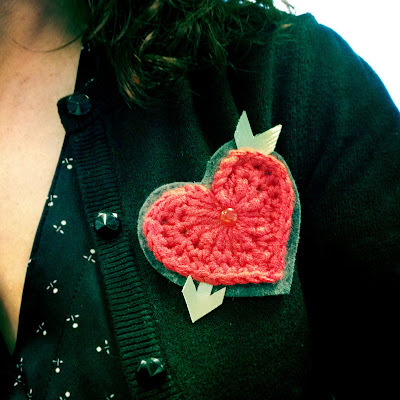 It's a clever use of paper-cut hearts as petals around a lollipop. Will post pics once we make some more progress.